Unique Feature: The lake offers a great variety of structure. Weed beds, rock outcrops, cabbage weed all present great fishing options. Napken Lake offers exceptional walleye and pike fishing throughout the season. With deep water, shallow water, excellent structural features, weeds and miles of river fishing as well, Napken Lake is exceptional. A new outpost camp has been recently built on the site, but the walleye fishing remains the same – outstanding ! Napken Lake also offers incredible pike fishing – with plenty of big fish. Perfect for pike, Napken has extensive weedcover, lots of shallow bays, feeder creeks, river cuts, islands, main-lake points and shoals that attract and hold pike. A versatile angler could fish northerns here a dozen different ways – and catch fish with every approach.Although the pike fishing is great, walleyes are the mainstay at Napken, and multiple limit outings are an everyday expectation. Jigging the points and shoals, trolling body baits along rocky shorelines or weedlines, and live-bait rigging the shallow bays will produce consistent walleye action. The absolute best fishing came from very shallow water on points, over shoals, in the bays, along weedlines. 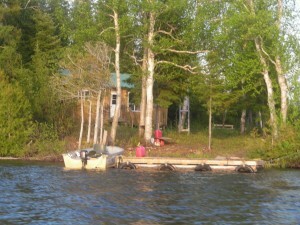 The cabin is equipped with propane fridge, stove with an oven, pots and pans and all eating and cooking utensils. There are lanterns for light and a wood stove for heat. These camps are rustic but very comfortable and offer you a true wilderness experience without missing out on the necessities.